Philippine Army troops have seized a terrorist stronghold in Lanao del Sur, killing three members of the Islamic State-affiliated Maute Group. The terrorists are survivors of last year’s six-month siege of Marawi City, who have since rebranded themselves as ‘Dawlah Islamiyah – Lanao’ (DI-Lanao). 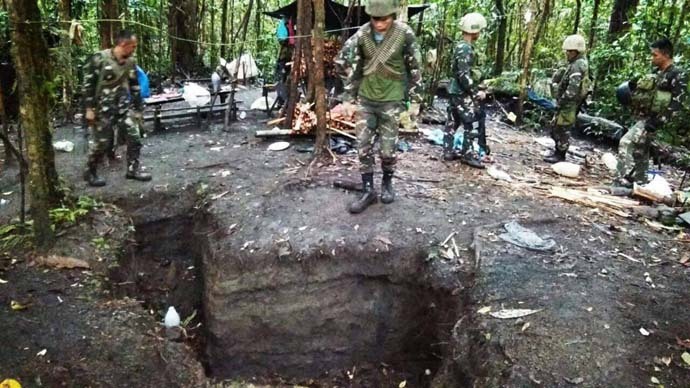 The terrorist stronghold, harbouring about two dozen islamist fighters, was taken out today (Friday, January 25) by the 103rd “Haribon” Infantry Brigade. The militants — believed to be led by the Islamic State’s ‘emir’ in Southeast Asia, Abu Dhar — were first encountered by the 55th “Vigilant” Infantry Battalion at about 8am yesterday. The troops had engaged the group following tip-offs about the terrorist stronghold from residents of Sultan Dumalandong municipality. The initial gun fight lasted for about 10 hours until the beleaguered terrorists consolidated a defensive position in their camp, which featured trenches and fortified bunkers. Colonel Romeo S Brawner, commander of the 103rd Infantry Brigade, said that despite the enemy’s home advantage, his troops were able to gain ground and penetrate their defensive lines. “Immediate fire support was provided through artillery and helicopters, sending the DI-Lanao remnants into their bunkers,” he said. Col. Brawner added that initial reports suggested that three DI-Lanao terrorists were killed during the assault, with others critically wounded. Three government troops sustained minor injuries. He also said that following the chaos unleashed in Marawi City last year, local people had turned their faces against the various Islamist groups in Mindanao. “People are now aware on the destruction brought by these violent extremists. Communities now willingly give out information to government troops to rid their communities of terrorists. “With the support we are receiving from the populace, we are moving forward to liberate communities from the influence of the DI-Lanao remnants. “We will weaken their will to fight – either through lethal or non-lethal means. We will take them out of their comfort zones until they have no other option but to die or return to the folds of the law. “We are a determined force. Together with our fellow Meranaos, we will serve justice to the people who destroyed Marawi City,” he said. At the same time, two Maute Group fighters, including a child, surrendered to the Army in the neighbouring municipality of Butig, Lanao del Sur, today. Elsewhere, an alleged member of Abu Sayyaf was arrested in a village near Zamboanga City. Daud Isnani, alias Umbra, aged 33, is accused of seven counts of kidnapping and illegal detention.